On Gandhi's demand for bringing fuel under the ambit of the GST to make petrol and diesel cheaper, is helping the super-rich rather than the poor. AHMEDABAD: On a day Rahul Gandhi hit out at the Centre over the current four-layer GST structure, Railway Minister Piyush Goyal wondered if the Congress leader's demand to cap the indirect tax at 18 per cent was aimed at offering relief to the super-rich at the cost of poor. 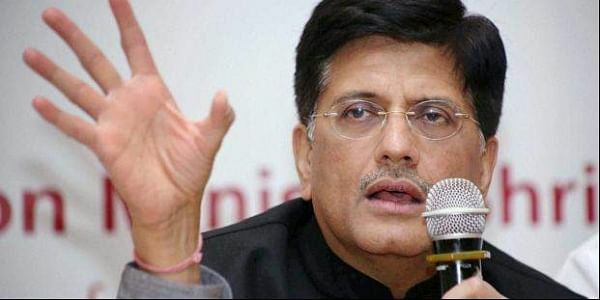 On Gandhi's another demand for bringing fuel under the ambit of the GST, a move which he claimed will make petrol and diesel cheaper, Goyal said if the Congress supports such a course at the GST Council, the government is willing to "move forward" in that direction. "There is a huge economic disparity in our country. While on the one side there are poor citizens, on the other side we have billionaires. Does Rahul Gandhi want to put more burden on the poor and farmers? Does he intend to make those billionaires' items cheaper?" Goyal told reporters here today. During his interaction with traders in Surat earlier in the day, Gandhi said the Modi government's GST will not work as it has four layers. "We had said that maximum cap on taxes should be 18 per cent but they did not listen to us," he said. "Is he (Gandhi) angry because Modi government made luxury cars used by the rich people costlier? We did that to save the poor from high tax burden. It seems Rahul either does not understand the economy or he does not have any sympathy for the poor, as he wants lesser tax on rich people's items," he said. Reacting to former prime minister Manmohan Singh's remark that the Centre's ambitious bullet train project was an "exercise in vanity", Goyal said it was "on the anvil" since the time when the UPA was in power. "Though the project was on the anvil for the last 6-7 years, the previous government did not pay any attention as they were busy doing corruption. They were not keen because there was no chance of corruption in the project," he alleged. Goyal said the bullet train project between Mumbai and Ahmedabad, is actually "cheaper" than the Metro rail project. "For each kilometre, Metro costs around Rs 250 crore, while the bullet train will cost only Rs 200 crore. Further, we received loan at just 0.1 per cent," the minister said.